Paolo Taviani (Italian pronunciation: [ˈpaːolo taˈvjaːni]; born 8 November 1931) and Vittorio Taviani (Italian pronunciation: [vitˈtɔːrjo taˈvjaːni]; 20 September 1929 – 15 April 2018), collectively referred to as the Taviani brothers, were Italian film directors and screenwriters who collaborated in productions of note. Paolo Taviani's wife Lina Nerli Taviani has been costume designer of many of their films. At the Cannes Film Festival the Taviani brothers won the Palme d'Or and the FIPRESCI prize for Padre Padrone in 1977 and Grand Prix du Jury for La notte di San Lorenzo (The Night of the Shooting Stars, 1982). In 2012 they reached again the top prize in a major festival, winning the Golden Bear at the Berlin International Film Festival with Caesar Must Die. Vittorio Taviani died on 15 April 2018 at the age of 88. Both born in San Miniato, Tuscany, Italy, the Taviani brothers began their careers as journalists. In 1960 they came to the world of cinema, directing with Joris Ivens the documentary L'Italia non è un paese povero (Italy is not a poor country). 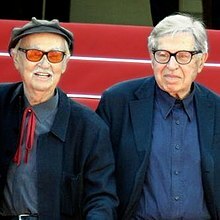 They went on to direct two films with Valentino Orsini, Un uomo da bruciare (A Man to Burn) (1962) and I fuorilegge del matrimonio (Outlaws of Marriage) (1963). Their first autonomous film was I sovversivi (The Subversives, 1967), with which they anticipated the events of 1968. With actor Gian Maria Volonté they gained attention with Sotto il segno dello scorpione (Under the Sign of Scorpio, (1969) where one can see the echoes of Brecht, Pasolini and Godard. In 1971, they co-signed the media campaign against Milan's police commissioner Luigi Calabresi, published in the magazine L'espresso. The revolutionary theme is present both in San Michele aveva un gallo (1971), an adaptation of Tolstoy's novel The Divine and the Human, a film greatly appreciated by critics, and in the film Allonsanfan (1974), in which Marcello Mastroianni has a role as an ex-revolutionary who has served a long term in prison and now views his idealistic youth in a much more realistic light, and nevertheless gets entangled in a new attempt in which he no longer believes. Their next film Padre Padrone (1977) (Palme d'Or at the Cannes Film Festival), taken from a novel by Gavino Ledda, speaks of the struggle of a Sardinian shepherd against the cruel rules of his patriarchal society. In Il prato (1979) there are nonrealistic echoes, while La notte di San Lorenzo (The Night of the Shooting Stars, 1982) narrates, in a fairy-tale tone, a marginal event in the days before the end of World War II, in Tuscany, as seen through the eyes of some village people. The film was awarded the Special Jury Award in Cannes. Kaos (1984)—another literary adaptation—is a poignantly beautiful and poetical film in episodes, taken from Luigi Pirandello's Short Stories for a year. In Il sole anche di notte (1990) the Taviani brothers transposed in 18th century Naples the story from Tolstoy's "Father Sergius". From then onwards, the Tavianis' inspiration proved faltering. Successes like Le affinità elettive, (1996, from Goethe) and an attempt to woo the international audiences like Good morning Babilonia, (1987), on the pioneers of cinema history, alternate with lesser films like Fiorile (1993) and Tu ridi (1996), inspired by the characters and short stories of Pirandello. In the 2000s, the brothers turned successfully to directing television films and miniseries, such as Leo Tolstoy's Resurrection (2001) and Alexandre Dumas's Luisa Sanfelice (2004), as well as La masseria delle allodole (2007), presented at the Berlin Film Festival in the section 'Berlinale Special'. Their film Caesar Must Die won the Golden Bear at the 62nd Berlin International Film Festival in February 2012. The film was also selected as the Italian entry for the Best Foreign Language Oscar at the 85th Academy Awards, but it did not make the final shortlist. On 15 April 2018, Vittorio Taviani died in Rome after a long illness at the age of 88. 1977: Palme d'or at Cannes Film Festival for Padre Padrone - Father and Master. 1978: Special David di Donatello for Padre Padrone - Father and Master. 1982: Grand Prix at Cannes Film Festival for The Night of the Shooting Stars. 1983: David di Donatello for Best Film and David di Donatello for Best Director for The Night of the Shooting Stars. 1984: Italian Golden Globes Golden Globe for Best Film for The Night of the Shooting Stars. 1985: Italian Golden Globes Golden Globe for Best Film for Kaos. 1985: David di Donatello for Best Script for Kaos. 1986: Leone d'Oro (Golden Lion) Life Career of the Venice International Film Festival. 2007: Efebo d'oro for La Masseria delle Allodole. 2008: Laurea honoris causa in "Cinema, Theatre and Multimedia Production" by the Faculty of Literature and Philosophy of the University of Pisa. 2012: Golden Bear and Prize of the Ecumenical Jury - Berlin International Film Festival for Caesar Must Die. 2012: David di Donatello for Best Film and David di Donatello for Best Director for Caesar Must Die. ^ "Jail docu-drama Caesar Must Die wins Berlin award". BBC News Online. 2012-02-19. Retrieved 2012-02-19. ^ (in Italian) "L'Italia candida agli Oscar il film dei fratelli Taviani". Gazzetta di Parma. 26 September 2012. Retrieved 26 September 2012. ^ "Italian film-maker Vittorio Taviani dies". BBC News Online. 16 April 2018. Retrieved 16 April 2018. ^ The Associated Press (15 April 2018). "Vittorio Taviani, of Italian Brother Directing Team, Dies". The New York Times. Retrieved 16 April 2018. ^ "24th Moscow International Film Festival (2002)". MIFF. Archived from the original on 2013-03-28. Retrieved 2013-03-31.